I have actually never been, but I have heard of great finds and even greater food to be had at the St. James the Great Bazaar. What's more, my SIL has been selling clothes and food there for several years now. 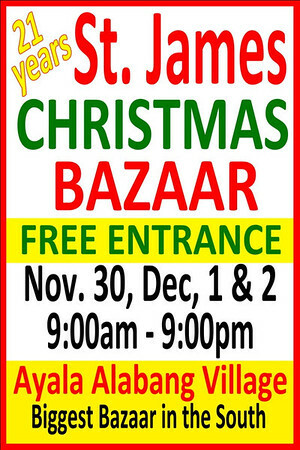 The biggest bazaar for people living in the South will be held at the Cuenca Community Center and St. James Parking Lot this November 30, December 1 and 2... from 9:00 AM to 9:00 PM. Don't be surprised if you see a lot of imported goods (you might find spenco shoes or Korean magic scarves as well as fab boots) because sellers in this bazaar really source out their wares the entire year. My SIL will be selling smocked dresses for little girls. Expect wares from all over the country too, as well as delicacies. Bring fans and your own water though (unless you want to cease shopping just to buy water) if you're coming during the day, because the crowd will be merciless in their hunt for great finds and good bargains. Bring cash (of course) and eco bags too, so that you don't have to worry about having to carry things around. If you can, collude with friends and family living in the area to just drop you off there and pick you up... or at least let you park your car in their garage. Enjoy Christmas shopping and know that the proceeds of this event all go to the Church.